Is Acnezine What You Need to Fight Acne? 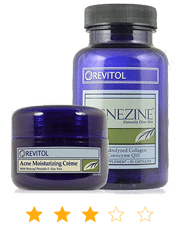 If you watch the late-night and early-morning television news on CNN, FOX, ABC, CBS, or NBC in the United States, chances are that you have seen an advertisement for the acne-fighting duo of Acnezine (made by Revitol). Offering an antioxidant supplement and a moisturizing cream, Acnezine advertises itself as a complete skin care management system that can clear your skin in just weeks. In the USA, Acnezine is a heavily advertised acne treatment system. The acne products promoted by Acnezine include a moisturizing cream and an antioxidant supplement. Acnezine’s “moisturizer” contains enough benzoyl peroxide to fight acne bacteria, but also enough benzoyl peroxide and harsh botanical ingredients to guarantee your skin will dry out. The Acnezine antioxidant formula will increase sebum production in your skin. No one who has acne should use the Acnezine antioxidant formula. The “moisturizer” may be OK if your skin resists chemical irritation—but there are many more effective products. Acnezine’s moisturizing cream (more like a gel) is a 5% benzoyl peroxide gel mixed with allantoin, aloe juice, birch extract, bilberry extract, green tea extract, citrus extract, lemon peel oil, and tea tree oil, along with a dozen more natural ingredients. Acnezine’s antioxidant supplement offers 67% of the recommended daily intake of vitamin E, 83% of the recommended daily intake of vitamin C, 88% of recommended daily intake for vitamin B2 (riboflavin), 100% of recommended daily intake for vitamin B1 (thiamin), 416% of recommended daily intake for vitamin B12 (cyanocobalamin), and 1250% of recommended intake of vitamin B6 (pyridoxine HCl), along with 50 mg of alpha-lipoic acid, 10 mg of CoQ10, 30 mg of curcumin (the antioxidant found in turmeric), and a small amount of proline from chicken collagen and trace amounts of other herbs and nutrients. The list price for a one-month supply of Acnezine is US $69.99, but it’s not hard to find the product for as little as $26.35 on Amazon. What does science tell us about these ingredients? Do the Ingredients in Acnezine Cream Really Work? There’s no doubt that a 5% benzoyl peroxide gel or cream will kill acne bacteria. The US Food and Drug Administration specifically authorizes a claim that 5% benzoyl peroxide is generally recognized as safe and effective, or GRASE. A 5% benzoyl peroxide gel will usually get rid of about 20% of blackheads and whiteheads during the first week of use, and another 15% by the end of the first month. It will usually eradicate about 30% of pimples during the first week and another 30% by the end of the first month of use. The problem is that this strength of benzoyl peroxide can also cause dryness, burning, stinging, itching, redness, and peeling. In the old days, almost no one could use 5% benzoyl peroxide for more than a month because the side effects were too bad. 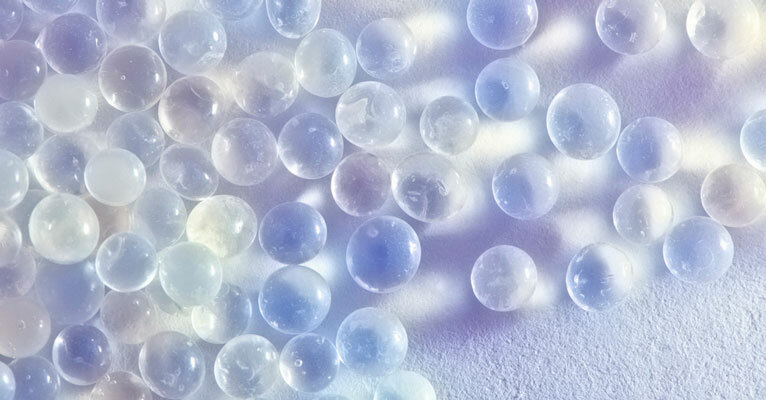 Nowadays, there are new formulations of benzoyl peroxide that disperse it as microcrystals (that don’t get stuck in the openings of pores so that they just irritate skin without ever reaching the bacteria inside the pore) and microspheres (so they release benzoyl peroxide slowly over time). much better than traditional forms of benzoyl peroxide. The problem with Acnezine is that it does not contain the new low-irritant formulations of benzoyl peroxide. It contains the old high-irritation formulation of benzoyl peroxide. Even worse, many who first begin using Acnezine don’t see any observable results as quickly as they might like, which often prompts them to apply more amounts (thus causing further inflammation) or makes them quit altogether. You should start the product slowly, using smaller amounts just once a day. Gradually you may be able to use the product twice a day in larger amounts, but you must avoid sun or use at least SPF 15 (if you have dark skin ) to SPF 70 (if you have fair skin) sunblock to prevent sunburn and the formation of freckles and brown spots as acne heals. One ingredient that caught our attention is curcumin and the inclusion of biopiperin, which helps the curcumin absorb better and work better. Curcumin is a powerful, anti-inflammatory active turmeric ingredient that can be beneficial for the irritation and redness that often come with acne. However, there’s only 30mg per capsule. That is probably not enough, considering 500mg is normally what’s recommended. Most of the ingredients in Acnezine’s antioxidant supplement can have unintended side effects. The main ingredient, Ester C is an ascorbic acid salt used as an alternative to Vitamin C. Vitamin C is too acidic for most people and often isn’t absorbed properly. Too much Vitamin E, like the amounts present in Acnezine, can actually produce more amounts of sebum to be secreted, which further clogs up your pores. Some of the agents are also uneffective as well. Alphy-lipoic acid, even in the small amounts present in Acnezine, can help correct “saging” skin and outward facing acne scars. For cells to use Alpha-lipoic acid, however, they require Vitamin B (biotin) – which is missing from Acnezine. There are other ingredients in this cream that can cause problems for sensitive skin, especially the allantoin, lemon peel oil, and citrus extract. If you have allergies, if you tend to flush or blush when you are embarrassed or excited, and especially if you have rosacea, you must not use this product. 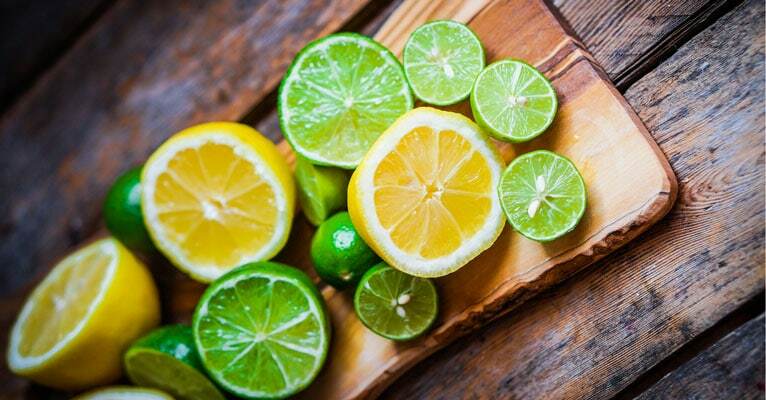 Both lemon peel oil and citrus extracts can be troublesome for skin. On the other hand, there are also ingredients conspicuously missing. In order to offset the effect of BP, many acne treatment contain necessary ingredients like toner, micro-dermabrasion compounds, exfoliants and even some types of skin cleanser. But Acnezine doesn’t appear to have anything to help. Do the Ingredients in Acnezine’s Antioxidant Formula Really Work? It’s considered a given that antioxidants are always beneficial for your skin—except they aren’t. Most of the ingredients in Acnezine’s antioxidant supplement can have unintended side effects. A Dutch study found that the skin of men who consume the highest amounts of vitamin E (equivalent to taking just 20 IU of vitamin E a day, the amount of vitamin E in Acnezine) produces up to 30 times more sebum. Vitamin E can contribute to clogged pores. Vitamin B6 in the doses used in this product usually does not cause skin problems—but taking too much vitamin B6 can and does cause a reaction similar to rosacea, with numerous tiny red pimples breaking out on the nose and cheeks. Vitamin B12 in the doses used in this product also usually does not cause skin problems—but taking too much of the product could cause the formation of numerous, identically sized and shaped pimples breaking out all at once. Small amounts of vitamin C are helpful in stimulating the immune system. However, the skin benefits more from ascorbyl palmitate used in ointments than from ascorbic acid used in nutritional supplements. Alpha-lipoic acid, even in the relatively low dosage included in this formula, can help correct “sagging” skin and outward-facing acne scars. For cells to use alpha-lipoic acid, however, they require the B vitamin biotin, which is not included in this formula. The proline (“chicken collagen,” which is basically chicken bones turned into Jell-O) in Acnezine is needed for the synthesis of collagen under the skin. This is helpful in preventing pitted scars on dry skin, although oily skin usually does not need additional proline. At least Acnezine provides collagen in the nutritional supplement rather than in the skin cream—collagen applied on the skin cannot be absorbed into the skin. Could Acnezine help clear up your skin? The answer is a definite “maybe.” If you look at the reviews for this system, many people have some of their blemishes clear up after using benzoyl peroxide. The antioxidant supplement, however, probably causes as many skin problems as it corrects. A bigger concern with the Acnezine system is that it does not include a cleanser, a toner, an exfoliant, microdermabrasion products, or probiotic supplements that can reduce inflammation. You’re also out of luck if it doesn’t work for you, as their so-called money back guarantee says you can only return the product for a refund only if it’s unopened and unused. For these products, your best bet is a money-back acne treatment system like Exposed Skin Care.